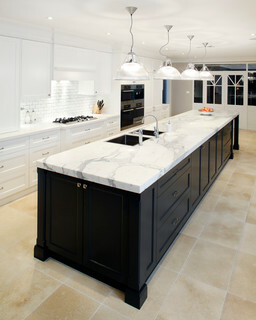 This design showcases the different elements of the kitchen as pieces of beautiful furniture, not just workstations. A way to incorporate this idea is through an island, raising it on legs or including intricate paneling or a contrasting top and sides. The modern traditional style (seen below) will be one of the most influential looks of 2015. Homeowners are shunning ultrasleek, contemporary kitchens in favor of spaces that are warm, homey, and reflect themselves. 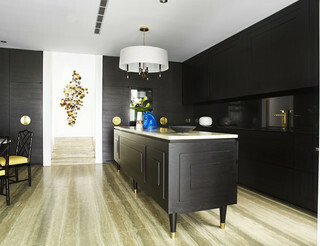 Modern traditional style affects everything from cabinet design to materials, colors & textures. Classic door profiles, such as Shaker doors, are replacing flat-panel cabinet doors. Flat-panel cabinet doors are being replaced with classic door profiles, such as Shaker doors. Materials are being mixed, such as stainless steel with wood, and wood with marble. Modern glass backsplashes and chrome handles are being replaced with traditional elements, such as tile with black, pewter, and brushed-nickel fittings. Stay tuned for more kitchen looks expected in 2015!